The core brick set in our range of Machines & Mechanisms solutions, this set includes full-colour building instruction booklets for 10 principle models and 18 main models. Two learners can use the set simultaneously, with each learner building half of the model with their own set of building instructions. 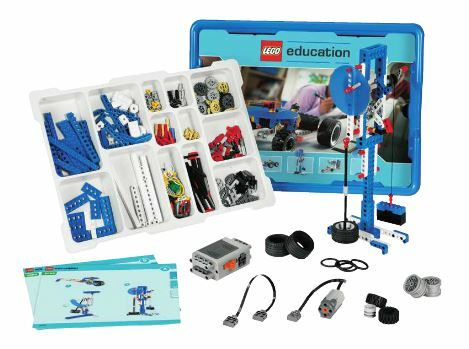 Combine with curricular-relevant activity packs and add-on sets to carry out a broad range of activities within design technology, science and mathematics. The Pneumatics Add-on Set for the Core Set provides five principle models and four real-life pneumatics models. Includes full-colour building instructions, pumps, tubes, cylinders, valves, air tank and a manometer, which can also be used with LEGO MINDSTORMS sets. This exciting add-on set allows students to learn about renewable energy sources and can be used with the Simple & Powered Machines Set and LEGO MINDSTORMS sets. The set includes a solar panel, turbine blades, a motor/generator, LED lights, an extension wire, a LEGO Energy Meter and full-colour building instructions for six real-life LEGO models to build with Core Set.